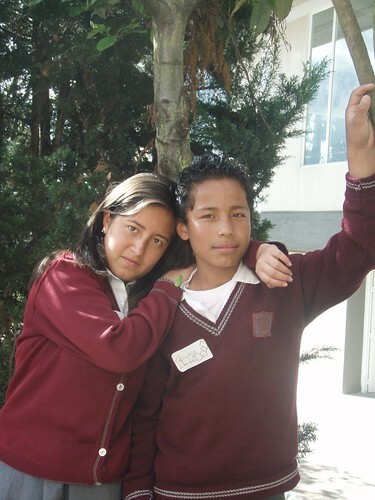 We, Tatiana and Kyle, have started working together in La Guajira. This week, we are training a group of students from the University of La Guajira to be digital storytelling workshop leaders. In partnership with Grupo Motivar at the University of La Guajira and the Fundación Cerrejón de Fortalecimiento Institucional, the group of students we train will lead digital storytelling workshops in small towns in La Guajira. From August-December of 2010, the Fundación Cerrejón de Fortalecimiento Institucional held an essay contest for students in La Guajira living in towns that receive royalties from Cerrejón. Royalties are an additional tax payed by corporations that extract non-renewable resources. Natural gas, coal, and salt are all currently being extracted in La Guajira. The essay contest was designed to get young people thinking about the proper use of royalties in their towns in order to build a generation committed to development in La Guajira. The students we train at the University of La Guajira will work with the five finalists from the essay contest to convert their essays into digital stories so that they can share their ideas more easily with their communities. The students will be working in pairs in schools in Barrancas, Albania and Hatonuevo once a week for 10 weeks. We’re excited about this training as a way to make digital storytelling permanent in La Guajira. We have already worked with Cerrejón to apply for a grant to fund our students to do more digital storytelling work in August with this year’s essay contest. We have also investigated social programs in other towns in the area that are interested in digital storytelling that we will connect our students to. We’re hoping to make digital storytelling sustainable and let it take off on its own by teaching what we’ve learned about leading our workshops to local leaders. From September through November ExpresArte has kept up digital storytelling in Colombia, this time in Riohacha, La Guajira. 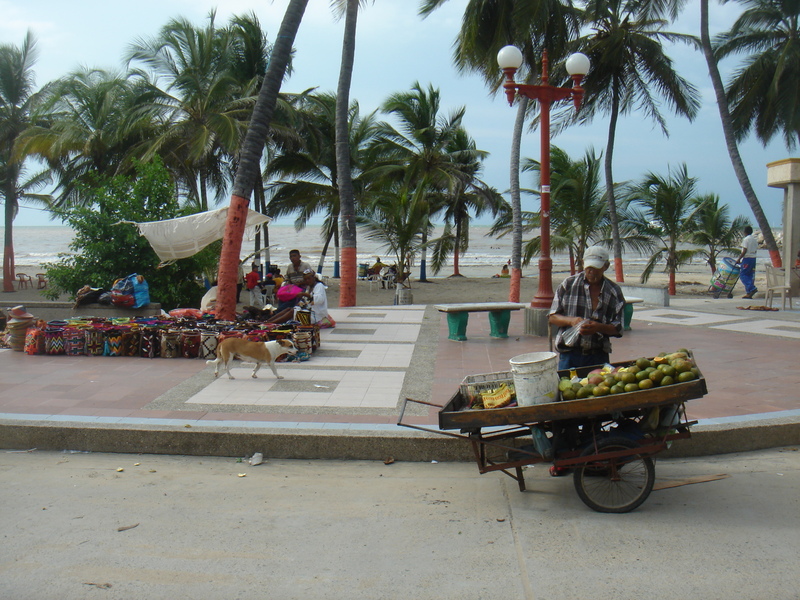 Riohacha is a small city on the Caribbean coast near the Colombia-Venezuela boarder. The Livio project was a partnership with Livio Reginaldo Fishione, a public school, and Atala the computer teacher there. Using the school’s computer lab, I worked weekly with Livio’s tenth grade class (all 140 of them) to make digital stories about the environment in Riohacha. 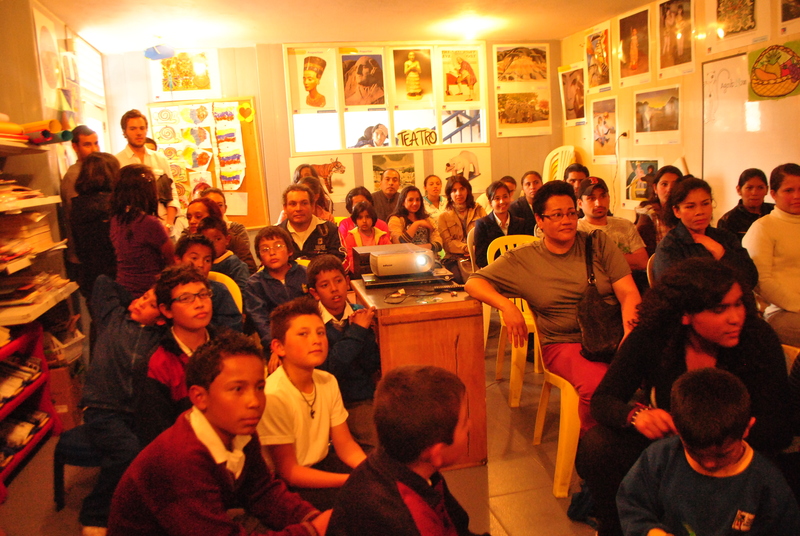 The original idea was to focus the stories on ecological themes, but the students were more interested in writing about specific aspects of their lives in Riohacha, that I don’t think most people would consider “environmental”–in a traditional sense at least. Into the project, I started to see the stories as focusing on the lives and places that make Riohacha what it is. Interestingly, a lot of students wrote stories that mixed fiction and non-fiction. The Livio project was not easy. 140 students was too many for me to connect with and support the same way we were able to in Bogotá. The city itself also presented some challenges. 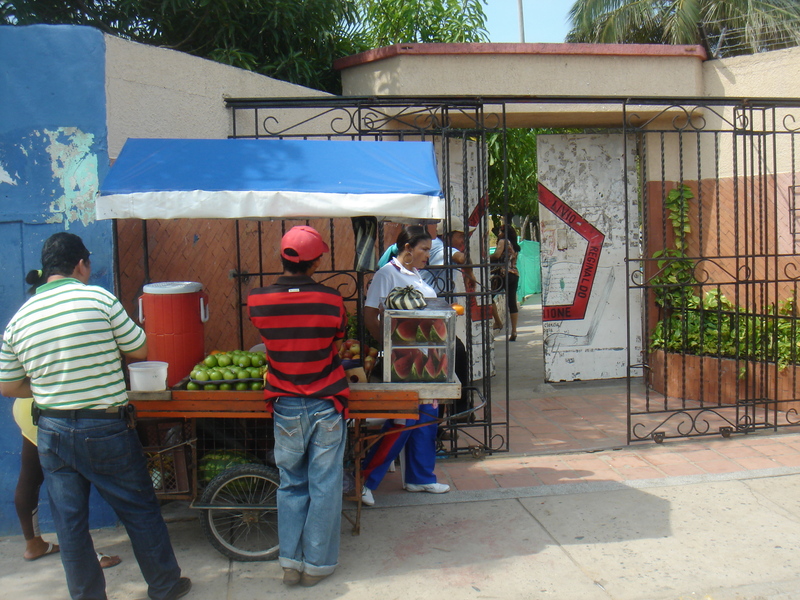 I started the Livio project as soon as I arrived in Riohacha and did not know the place at all. These projects require a huge time investment and I was often thrown off by teacher strikes, power outages and faulty computers. Despite the obstacles, the students really enjoyed the project and (incredibly) produced stories. Unfortunately, I was not able to document the process as well as we did in Bogotá, but on our final screening I interviewed some students about their projects. Those stories and statements are on the ExpresArte Students’ blog. The experience at Livio taught me a lot more about what kind of supports I need to make a digital storytelling workshop successful. 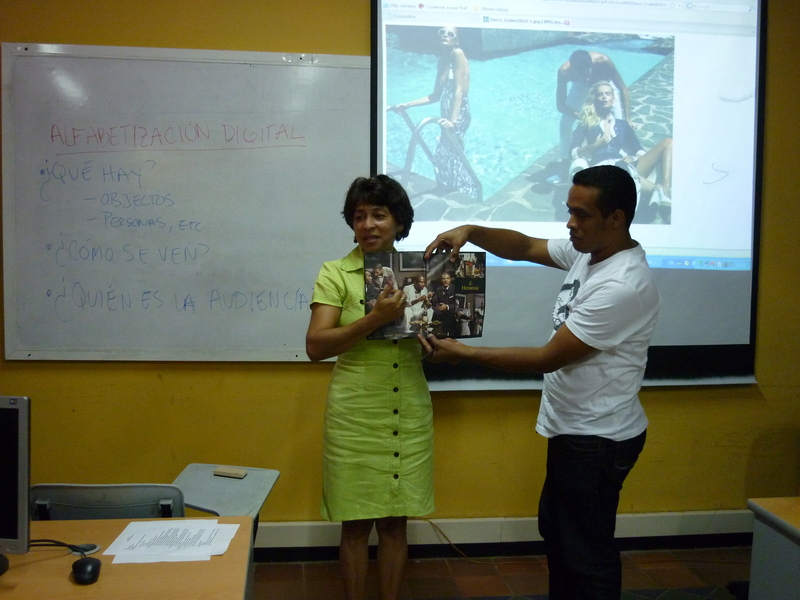 Using what I learned, I have already developed two upcoming DS workshops, one in Cuba and one in La Guajira. More on those workshops to come. This project would not have been possible without the help of Fanna Gamal, another Tufts graduate and recent ExpresArte team member. I want to give a big thank you to Jackie & Sid Mintz, Phil Fornaci, Susan & Hal Malone, Peter & Jevne Diaz, Tabitha Stewart, Lauren Young, Laura Weeldryer, Diana Medina & Pat Halle. Without all of your help the project could not have gone on. Gin Ferrara! Also Gin Ferrara sorry I forgot you earlier. If you’ll be in the Boston area on Thursday, November 4th, then join us for the premiere of our documentary! We finished the workshop on Friday with a screening of the students’ digital stories. We transformed our classroom into a theater and invited the students’ families to come see the results of our two week workshop. We were really happy with the turnout, we filled the room and almost every student had a guest present. 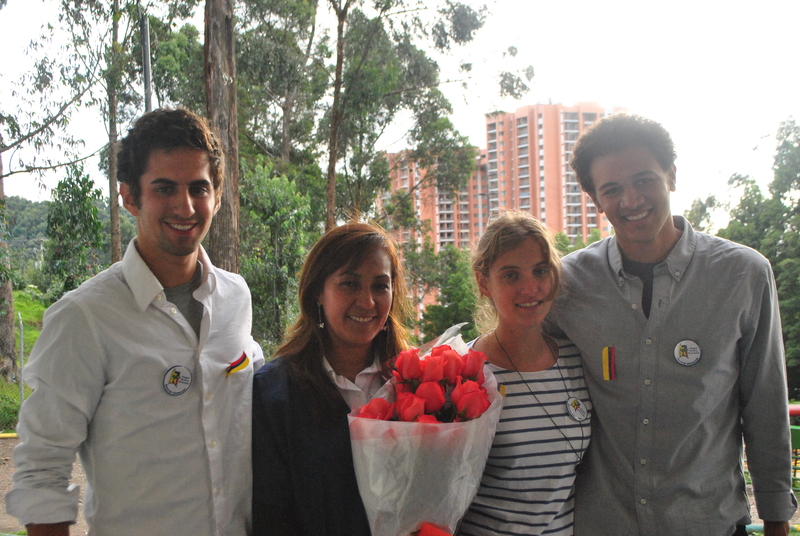 Before the guests arrived, though, the students prepared a farewell presentation for us. They acted out the first day we met, with each of us played by a student; they sang us a song; they gave us goodbye cards; and Martha, their teacher, thanked us for volunteering. Because of our time crunch, so much of the workshop has been focused on leading the students through to the next stage of production, and we have not had very much time just to play, chat and get to know them. The students’ presentation showed us how much they enjoyed the workshop and our time together. We were all moved; it was a great way to start the screening. 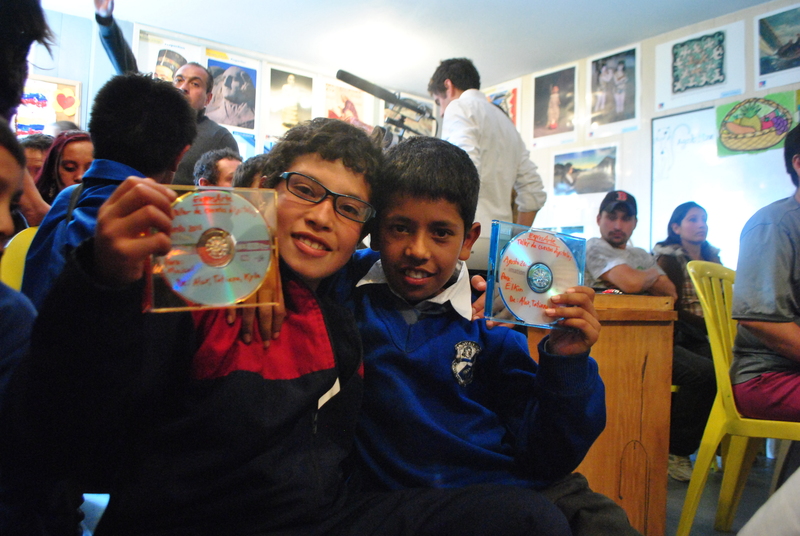 The digital stories went over really well, and after the screening we presented each student with a DVD of all the stories produced in the workshop. We were able to publicly thank Tufts and the IGL for funding us, as well as Martha and the el Hogar staff for their incredible support. After we spoke, Ximena, the director of el Hogar, thanked us for our work and invited us back to el Hogar in the future (“el Hogar sigue abierto a ustedes“). Martha also told us that the screening was the largest gathering of our students’ parents they had ever had. We were thrilled. Check out this slide show of photos from the workshop, many taken by the students, and check the students’ blog to read their farewells and watch some of their digital stories. We started our second (and last) week of the workshop yesterday with much excitement. After a long weekend pause, we were finally able to see the photos the students have taken. It is incredible how, without any formal photography lessons or exposure to the medium, some students captured the most inspiring of moments. Each student’s roll is a reflection of their personality and the smile on their faces as we handed them out was priceless. Now, the second part of the workshop begins: editing. Before handing out the pictures, we did a brief presentation on the software we will be using for the rest of the week, Final Cut Pro. To be completely honest, I personally expected the kids to be more excited about the program. As we went over the basic tools they will need to be familiar with, they just stared at the screen blankly–no questions, no comments. It is understandable, however, because this is an entirely new concept to most of the kids and we expect that they will be more enthusiastic when it is their chance to edit. After handing out the pictures, there was a brief moment of chaos. The students ran from one room to the other, peeking at their friends photographs, showing off their own. “Oohs” and “Aahs” inundated the room, making it hard to focus on the most important aspect of the entire workshop: putting the images and the words together. We asked each student to pick 10 of the photos that worked best with their story and arrange them chronologically. We should have done a better job at explaining the purpose of this, because when several kids arrived at the editing room, their pictures did not seem to match the words they had written. Perhaps it would have been wiser to have them indicate in their story when they wanted an image to be shown and which one. This is a good lesson we learned because for the rest of the week, we will be revising their story before they are able to edit. Time is of the essence now because we only have two days before the screening. This means that we need 14 kids to edit their movie and only about 6 hours to do so. It will definitely be a challenge to have all the videos organized by Friday, but the end product will be worth it. Check out the kids stories and some of the photographs they have taken on their blog. Our workshop is going great! We’ve had some really great days and some challenging ones . So far, our students have produced three writing assignments about their identity as it relates to Bogotá. Last night, they took their cameras home and today we went on a walk through their neighborhood so that everyone could finish their camera roll. The walk turned out to be more of a swim time in a creek that runs down the Andes in the students’ barrio than a strict photo shoot, but after two days of serious writing we didn’t mind. Alex and Tatiana jumped in with them, and we think it actually got us a lot closer to our students. The students are blogging (in Spanish) about their experience in the workshop, so they’re gaining computer skills beyond the editing software we’ll be using next week. The combination of traditional writing, blogging, photography and videography is really amazing to watch. We are running into some challenges getting our students to take “artisitc” photographs–mostly they want to photograph each other posing for the camera–and sometimes the days feel a lot like controlled chaos. However, after a good talk with their teacher, Martha, this afternoon we all started to realize how valuable this is for the students. They are learning the ins and outs of a new technology, which they’re rapidly becoming more comfortable with, and through their new tech-literacy they’re analyzing their relationship to their neighborhoods and the city. Next week the students will begin editing, and we’re confident that everyone will have a finished product they’re proud of by Friday the 20th. Monday, our first full day with the kids, went way better than we could have hoped. We started by decorating nametags and doing some short introductory interviews, and ended the day by introducing the kids to the video cameras, still cameras, and computers. For many of them, it was their first time ever touching these things. Still, the pictures they took came out great, and they were excited to write on a website for the first time ever. Tuesday was a bit rockier. We were clearly riding high from our great interactions on Monday. We planned an activity where the students would be split into three groups based on the concepts of shooting to write and writing to shoot. Our main goal was to teach the students about how images and words work together to tell a story. Writing turned out to be a much bigger challenge than we anticipated. The students were thrilled to take pictures, but when it came time to write they had a hard time connecting their ideas with the photographs. We didn’t explain this concept well and it really showed in the writing the students produced. The students could have used a really good primer, or example, on abstraction and how to write abstractly about photographs. We’re putting together a lesson on that for tomorrow, but it means cutting into time we had planned for other things. The good news is, we reevaluated our plan for the workshop and now have a much stronger plan. We also realized that digital storytelling is a really powerful tool. Even though we lost focus today, the kids are still really enthusiastic about the project and can’t wait to keep working.